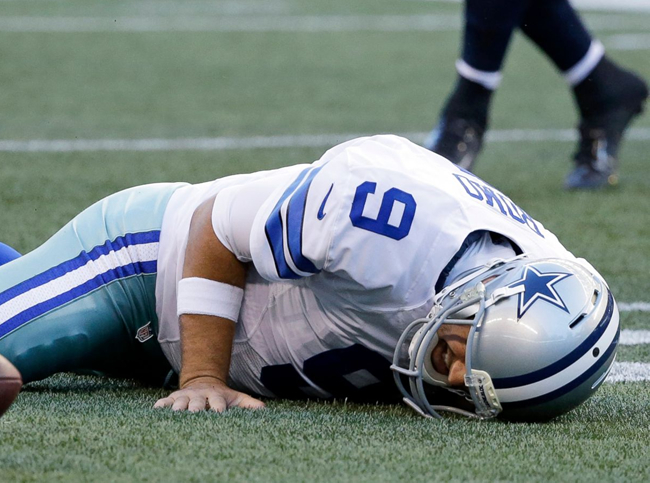 For those of you who haven’t heard, Cowboys QB Tony Romo has been sidelined by yet another devastating injury. It looks like he’ll probably miss at least half of the 2016 season, but is it best for his long-term health and well being if he never comes back? I think yes. First, let’s talk about the injury currently plaguing the Dallas signal caller. You can watch the play during which Romo sustained the ailment here (sorry, NFL won’t let me embed). As you can see, very early in the game, Romo’s protection collapses and he is flushed out of the pocket and starts to scramble. He doesn’t get very far before Seahawks Defensive End Cliff Avril hammers him from behind. Romo falls to what is essentially a sitting position, and Avril comes down on top of him, compressing Romo’s spine directly into the ground. Ouch. According to a really good article I read on Forbes.com–seriously, it does an awesome job of explaining the injury–an MRI revealed that Romo has a compression fracture of the L1 vertebra in his lower back. Basically, the stack of dimes Romo calls a spine was compressed so violently, that it is now a few dimes shorter than it used to be. Although I’m sure Romo will attempt to avoid it, this injury should require surgery to fix. Romo’s the kind of guy that will super glue his bones together if he thinks it can get him back on the field in time to play. If this injury is as bad as the reports say it is–and from the way he crumpled in a heap on the field, I think it is–the Cowboys should not allow that to happen. As I mentioned, the surgery would likely put him on the shelf for 6-10 weeks at least. But Romo’s not a young man anymore, and he’s not without a history of injuries either. His trading card might say he’s 36 years old now, but his body might be 50 by now. 2015: Broken collarbone – This is not a typo. He missed five more games. 2016: Compression fracture, L1 vertebra – Hopefully misses every game ever because he should stop. So…. seriously. Can he stop? Look. When Tony Romo is on the field–and this pains me greatly to say–he’s one of the better quarterbacks in the league. Yes, I know his reputation for not winning the big game–or even the sorta big games before even getting to the big game–but he should go down as one of the best quarterbacks in Cowboys history. Tony could walk away today and be, statistically at least, the best QB in Dallas Cowboys history–I’ll give Aikman the nod overall because he had great numbers and actually made it to, and won, a couple of Super Bowls. Romo could also keep playing, and eventually be stretchered off the field and spend the rest of his life in a wheelchair… as the best, statistically at least, QB in Dallas Cowboys history. Which would you choose? Ultimately, the choice is up to Tony Romo and, to a lesser extent, the Dallas Cowboys. At the very least, Tony should not try to rush himself back to finish the season. Last time he rushed back was 2015, and he re-fractured the collarbone in the same game. You don’t want to do that with your spine. Stay home, Tony. It’s time for me to hate a new Dallas Cowboys QB. Looking at you, Dak Prescott.